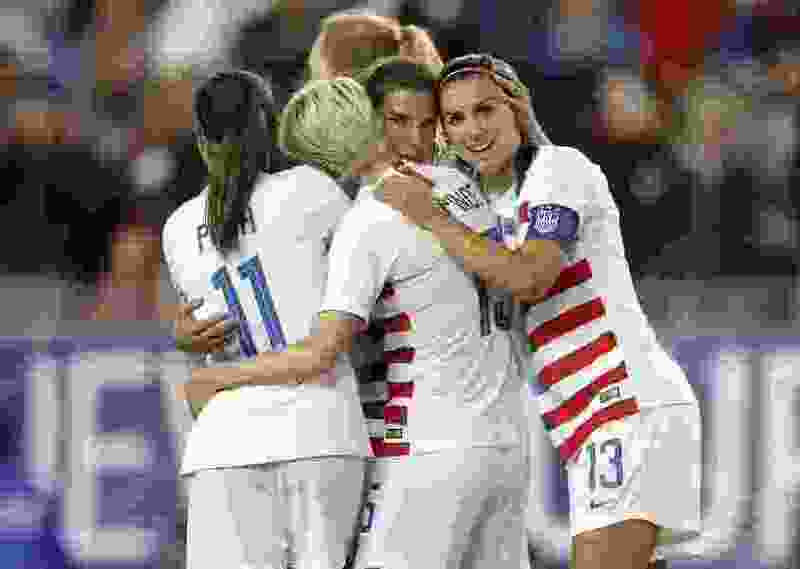 (Mike Carlson | The Associated Press) United States' Tobin Heath, second from right, is congratulated on her goal by Mallory Pugh (11), Megan Rapinoe and Alex Morgan (13) during the first half of a SheBelieves Cup soccer match against Brazil Tuesday, March 5, 2019, in Tampa, Fla.
Players for the U.S. women's national soccer team have filed a federal gender discrimination lawsuit seeking pay equal to that of their male counterparts. The action comes just three months before the team will defend its title at the Women's World Cup. The class-action lawsuit was filed Friday in federal court in Los Angeles under the Equal Pay Act and Title VII of the Civil Rights Act. It alleges gender-based discrimination by the U.S. Soccer Federation. The players allege they have been subject to ongoing "institutionalized gender discrimination," including unequal pay, despite having the same job responsibilities as players on the men's national team. The 28 members of the current national team player pool joined in the lawsuit. Sauerbrunn, and Royals teammates Christen Press and Kelley O’Hara are all parties in the suit. The U.S. Women's National Team Players Association was not party to the lawsuit, but in a statement said it "supports the plaintiffs' goal of eliminating gender-based discrimination by USSF." The U.S. Soccer Federation didn't have an immediate comment. The players are seeking equal pay and treatment, in addition to damages including back pay. The complaint was filed on International Women's Day. "Each of us is extremely proud to wear the United States jersey, and we also take seriously the responsibility that comes with that. We believe that fighting for gender equality in sports is a part of that responsibility. As players, we deserved to be paid equally for our work, regardless of our gender," forward Alex Morgan said in a prepared statement. This is not the first time the players have sought equitable compensation and conditions. A group of players filed a complaint in 2016 with the federal Equal Employment Opportunity Commission that alleged wage discrimination by the federation. The players maintained that players for the men's team earned far more than they did, in many cases despite comparable work. The lawsuit effectively ends that EEOC complaint, brought by Morgan, Sauerbrunn, Megan Rapinoe, Carli Lloyd and former goalkeeper Hope Solo. The team took the fight into contract negotiations and struck a collective bargaining agreement in 2017 that runs through 2021. The players received raises in base pay and bonuses as well as better provisions for travel and accommodations, including increased per diems. It also gave the players some control of certain licensing and marketing rights. Specific details about the deal were not disclosed. "This lawsuit is an effort by the plaintiffs to address those serious issues through the exercise of their individual rights. For its part, the USWNTPA will continue to seek improvements in pay and working conditions through the labor-management and collective bargaining processes," the players' union said. The USSF has in the past maintained that much of the pay disparity between the men’s and women’s teams resulted from separate labor agreements. The US National Team Players Association says it backs the USWNT suit.